Dorchester to Lyme Regis via Bridport, a cycle ride of no more than 30 miles, but one of such diverse interest and delight that it merits a short holiday break all of its own. What better way of exploring an area than on a bike. Some steep hills, an uneven bridleway perhaps needing mountain bike style wide tyres, stunning scenery, wildlife, ancient habitats. Pack both your camera and your binoculars! Camcorder too if you have one. Perhaps you might like to print this guide and pop it into a plastic cover to take with you. Or you could perhaps take your tablet and access this page on there. View over Dorchester set in the lovely Dorset countryside. Copyright Photo by Cameronmarrett July 2009. Creative Commons Licence. Start this well earned break with an exploration of the delightful market town of Dorchester, Dorset's county town, There are plenty of walks to investigate. If it is a fine day take your camera to the top of the Keep Military Museum for some wide vistas. The town's most famous son was the writer, Thomas Hardy. The cottage at Higher Bockhampton where he was born and Max Gate in Alington Avenue, Dorchester. are both owned by the National Trust. Before you set out on the NCN2 to Lyme Regis spend a day exploring the cycle route north from Dorchester through the Frome Valley to to where the river rises at Evershot, about 14 miles. The River Frome is a delightful 30 mile long chalk stream that eventually flows into Poole Harbour. The arrowhead waymarked cycle route runs through typical Dorset countryside with the riverbank and delightful water meadows, farmland and the chalk downs. It is not all on country roads, some farm tracks need to be negotiated and if there has been a lot of rain they may get a bit muddy. Cycle down the hill towards the old Sherbourne Road and on to Charminster passing streams and water meadows. Water birds aplenty. Charminster is where the River Cerne flows underneath the church built in the eleven hundreds. Wolfeton House is open from June to the end of September. Lots of tales of ghosts!!! As Dorchester was a Roman town it is not surprising that a Roman Villa was found in Charminster in 1960. Had a lovely mosaic pavement. The A37 needs crossing next at Giles Cross and then cycle on through farmland to Bradford Peverell said to be one of the oldest villages in Dorset. If you are in the area in August an interesting detour would be the New Barn Field Centre which can be found a mile and half to the south of the village. Worth a visit, this living museum is a copy of an Iron Age Homestead – plus. Plenty to do! Muckleford next, home of the Muckelford Nature Reserve but this is difficult to access because of the very steep slopes and many nasty holes and definitely not recommended. Dorset Wildlife Trust are doing some excellent renewal. Attractive area. Frampton Parkland is a pleasing part of the cycleway which then runs on to Southover and Maiden Newton. 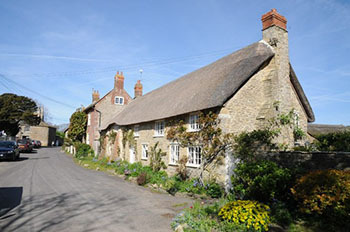 Frampton village with its thatched cottages and Almshouses stretches out along the Dorchester Road which runs parallel to the cycleway. Maiden Newton still has its old medieval market cross, although it is aeons since the market existed. The large village has known its troubles, Charles I stayed at the Rectory and there are bullet holes in the north door of the Church from Cromwell's army during the Civil War. A German plane shot a bullet through the East Window during the Second World War. On a happier note Queen Elizabeth II spent the night in the Royal Train parked on the line at Maiden Newton in 1952. Maiden Newton has one of the oldest fire engines in the country in working order. © Copyright John Lamper and licensed for reuse under this Creative Commons Licence. Follow the waymarked cycle track northwards now towards Evershot, depending on whether the terrain is wet or dry. A dry way would be through Chilfrome, past Holy Trinity Church and Cattistock. Otherwise off roading on Wraxall Lane. 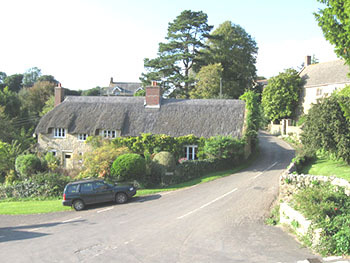 Evershot is the second highest village in Dorset at 625 feet. That Tardis like structure is actually an excellent venue for live music. The River Frome rises at St Johns Well which can be found down a narrow lane. It has been marked as part of a Millenium project, there are information panels that tell the story of the well and Evershot. This not being a circular cycle route the way back lies the way you came. Well – the countryside can look different the other way! If you prefer there is a station at Maiden Newton and trains go back to Dorchester. Check Traveline for timetables. Another day, or possibly two, could be spent with the 21 mile circular cycle route, Dorchester to Dorchester via Abbotsbury. The route starts off with a long, long climb and a long descent to the ancient village of Abbotsbury. A cuppa could be found here easily and/or a visit to the craft shops. The magnificent view of Chesil Beach to Portland alone makes this stop very worth the time. There is a 6 mile walk down to Chesil Beach. Takes in the Iron Age Fort that is Abbotsbury Castle which sits on a high hill overlooking the English Channel. On a clear day one can see for miles. Part of the walk goes along the South West Coastal Path, the longest footpath in Britain. Chesil Beach itself is a wide shingle beach that extends 18 miles from West Bay, where the shingle is small, to Portland where the pebbles are much larger. Part of the Jurrassic coast. At one time it was a smugglers beach. The area now has three protections, it is not surprisingly a Special Protected area, also a Site of Special Scientific Interest and a Special Area of Conservation. Abbotsbury Swannery, also part of the lagoon, is the only area of a managed colony of nesting mute swans. The whole thing goes back to well before the 1300's. 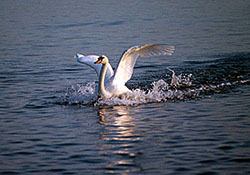 An intriguing insight can be found by visiting the Swannery and starting at Decoyman's House where there is a display. If your visit conicides with the end of July you might see a fleet of about 50 canoes in the lagoon rounding up the swans, at this time of the year flightless, so that they can be weighed and measured and the new ones ringed. Currently there are about 600 or so swans in the area. Next cycle on to Portesham where lived Admiral Hardy who as a Flag Captain, held the dying Admiral Nelson in his arms on the 'Victory' at Trafalgar. 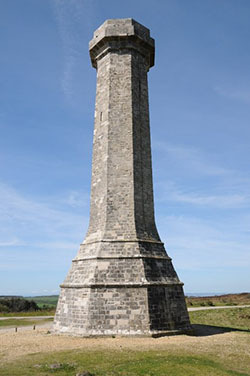 That enormous memorial that can be seen for miles is to Admiral Hardy, not the author, Thomas Hardy. The author believed that he was related to the famous Admiral, but was not able to prove it. As many genealogists know, these things are not always provable, but can only be put in the may be/may be not category. A visit to the monument would give the binoculars another good workout. It is on the top of Blackdown Hill above the village. Views are possible for miles over to the Isle of Wight and over most of Dorset. Spectacular. Friar Waddon was once part of the Parish of Portesham. Scene of a Time Team investigation in 1999. Bronze Age, Iron Age, Roman, Saxon, Medieval and 17th century show how the area has been settled for thousands of years. Charles 1 used Waddon House as a refuge for a while during the Civil War. On now to cycle though pleasant countryside to Winterbourne Monkton where the road crosses the A354. Winterbourne is a name for streams that do not flow in the summer months. Once the village was called Winterbourne Wast, and it was at that time the Monks of Wast owned the village. 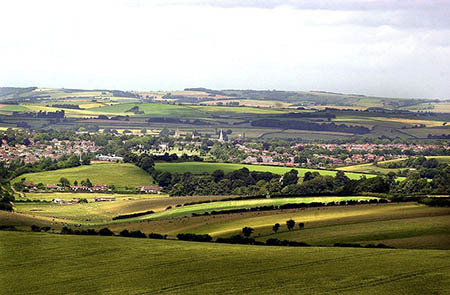 The village is overlooked by the site of Maiden Castle, well worth a visit, but that is best done from Dorchester itself. It is the largest Iron Age Hill fort in Europe, but goes back even further to the Neolithic. Just imagine the Roman general, Vespasian, trying to take the fort from the locals, must have been some battle! The Celts put up an incredible fight and the defences were well made over generations. Dorchester County Museum has an exhibition from Maiden Castle of its artefacts and its bloody battle. The road home to Dorchester runs past Winterbourne Herringstone, sometimes known just as Herringston, is a tiny hamlet with a 14th century house, not open to the public though. Now to leave pleasant Dorchester and tackle the National Cycle Network 2 proper. Some of the roads are very busy - in summer can be nose to tail - so take care. The route includes steep hills - check the brakes and gears! Maumbury Rings is the start of the ride, you will find this not too far from Dorchester West Railway Station. Take Weymouth Road and turn right into Maiden Castle Road where the NCN2 signs begin. Might be a good time to visit Maiden Castle if there has not been time to do it beforehand. The bridleway that follows is mountain bike country, rather uneven. Good touring bikes with wide tyres might also be OK. The route then passes over the river on to the B3159 and into Winterbourne St Martin, often called Martinstown. Was a winner of the 2007 Dorset Best Kept Village Award. Despite the winterbourne tag the village holds the UK Weather record for the Highest 24 hour total rainfall and that happened in July! Actually July 18th 1955 when they had 11 inches in 15 hours. The large bowl barrow overlooking the village is the Clandon Barrow and is Bronze Age. Cycle on towards Portesham passing Hardy's Monument at Blackdown again. Can be a bit traffic busy here. Follow the signs as the trail turns sharply right towards Littlebredy past the Valley of Stones which is a National Trust Reserve. It is where ancient man quarried the stones for the many megalithic sites in the area. Some achievement. It has a stone circle which looks man made but may well be due to a geological event. There is a noticeboard on the site giving details. The cycle trail now follows a nearly ten mile section of little villages, steep slopes and Dorset countryside. Little Bredy or Littlebredy, with its Iron Age Hill Fort, Old Warren, high above the village, is to put it mildly – beautiful. Hope the camera was not put away at the bottom of the backpack. Built in 1797 by Robert Williams the owner of Bridehead Estate as a Regency/Victorian model village. A good place for a stop for a while and a wander round. Here it is that the tiny stream, the River Bride, has its spring. The 5 acre Littlebredy Walled Garden with its lovely flower garden and walks is open to the public. There is an entrance fee. Makes a nice place for a break - tea and cakes! Long Bredy is the next village and Kingston Russell House is one of the first things one notices. Sadly not open to the public, it is the birthplace of Admiral Hardy in 1769. The land on which the house stands has been in the Russell family, ancestors of the Duke of Bedford, since the 1300's when it was granted to them by Edward III. The house itself dates from the late 1600's. We continue now cycling along the Bride Valley down Cox's Lane to Litton Cheney. 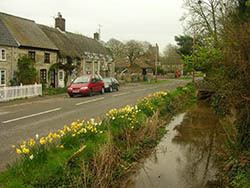 An attractive village of stone and thatch with a little sparkling stream. Worth a wander round. Take Litton Lane by the White House pub and perhaps take a detour down Rectory Lane to Puncknowle. How ever do you pronouce that? Apparently - Punnel! This is a peaceful, quiet village. The Crown Inn is stone and thatch and opposite the Church. Have a wander then go back along Church Street until you find Hazel Lane. Turn left to Swyre. Here you are above Chesil Beach. Take Swyre Road to West Bexington, then right to the South West Coast Path where the coastguards used to patrol to catch the smugglers. Return back to Swyre and along Hazel Lane to the NCN Route 2 again turning left into Bredy Road and ride on. The Saxon's called it Brideton, the town by the River Bride. The river disappears here and never meets the sea. Perhaps it did then, a thousand years can make a difference to a landscape. There is a walking trail through the town that is intriguing. The Robert's Trail, takes a tour of the lovely village and shows the hemp and flax business that Richard Roberts developed and put Burton Bradstock on the map as it were. There is a leaflet for sale at the local Post Office, quite a nominal fee. Handy for the walk and a memento afterwards. Here Chesil Beach has smaller pebbles with Jurrassic golden cliffs soaring above. Quite a diversity of fossils are abundant in the rocks. Specialist field really but visitors and their children have fun looking for them. The National Trust at Burton Bradstock has important conservation and visitor interests here with the Jurrassic Coast and the South West Coastal Path. Their always valuable cafe is available for a cuppa. The sea can look inviting, but it is not smart to swim here, the undertow is dangerous and the beach shelves fast. Retrace your ride back to the NCN2 and follow it to Shipton Gorge. A typical Dorset village is how they like to proclaim themselves and this is true. There is no Gorge at Shipton Gorge. The name comes from the de Gorge family who came over with William the Conqueror and took possession in the 1200's. They owned Litton Cheney as well. 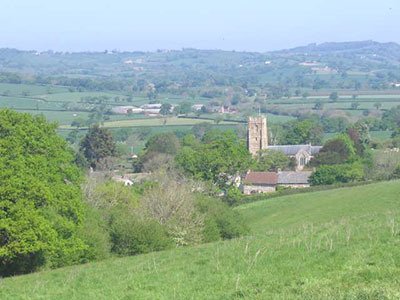 What the village of Shipton Gorge does have are eighteen pretty footpaths and 7 bridleways. Attractive little paths that invite, with wonderful vistas across the countryside. John Hicks rebuilt the church in Shipton Gorge in 1862. Thomas Hardy, the author, was articled to the architect and had input into this project. His poem “The Abbey Mason” is dedicated to John Hicks. Hardy remained interested in church architecture throughout his life. The cycle route now travels under the A35 to Uploders and Loders which are actually one parish, but do not seem so. Uploders is met first and consists of stone houses built in the 17 and 1800's with the River Asker running through the village. It passes at the back of many of the gardens in the village. The small river rises near Askerswell and ends as it joins the River Brit at Bridport. That terracing above the village is a medieval form of agriculture known as strip lynchets. Knowle Farm Cottage in Uploders is well known for the incredible 100 year old wisteria that adorns the house. Stunning display in season. Flowers get to four feet long! Loders also has attractive stone houses of the same vintage as Uploders. The River Asker runs through Loder too and it is probably this river that named the village. Originally it may have been known as the Lodour which means pool stream. Work at home is not a new phenomenon. At one time many of the cottagers in Loders were homeworkers for the rope and net industry in Bridport. 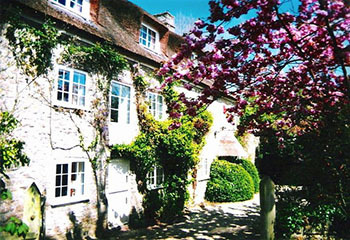 The attractive Loders Court was built at the end of the 1700's. It is said that the owner and builder, Sir Evan Nepean, entertained Nelson at the Court. This is quite probable as Sir Evan too was at one time an officer in the Royal Navy. Later became Under Secretary of State for War and then secretary to the Board of Admiralty. Among his later positions he became Commissioner of the Admiralty, but that was after the death of Nelson. One of the numerous tunnel legends is associated with Loders Court for it is said that a tunnel was started that was to lead to the local church. From Loders the cycle trail now leads on to the pretty village of Bradpole that has close ties with the British School system and the abolition of slavery. William Forster was born a Quaker in the village in 1818. He married Jane Martha Arnold daughter of the famous Thomas Arnold, Headmaster of Rugby School, on 15 August 1850 in Rydal, Westmorland. Jane's brother was the poet, Matthew Arnold. William, a robust and blunt man became a mill owner in Yorkshire in the early 1840's and represented Bradford in Parliament for many years. He took an interest in the anti slavery campaign very early in life. He was also largely responsible for the Education Act in 1870 and many other reforms. Bradpole remains in the educaton business. Interested in learning to ring church bells? Bradpole has a fully equipped learning centre and trains to the 'standard of the Central Council of Church Bell Ringers'. An interesting hobby personally recommended! Learning is progressive and fun. Bradpole has a simulator for learners so your mistakes will not be heard all over the village! Appeals to the mathematical and the musical mind. Why not learn to ring the biggest musical instruments in the world! 2011 was the 360th anniversary of Charles II's escape from the Battle of Worcester. While his supporters were trying to find a boat at Charmouth to take him to France and failing, he was hiding at Bradpole. There is a plaque in Lee Lane close to the main road that commemorates his time there. The cycle trail now crosses the A3066 and great care is needed here. From this point on to Bridport the trail is traffic free. However the cycle way in Bridport itself is mostly unsigned and parts are busy. Bridport is popular in summer. The old town of Bridport dates from Saxon times and makes a good stop for a couple of days to see the area. It is a market town and not a port. The seashore and the port is a over mile away at lovely West Bay where the River Brit meets the sea. A mini route cycle way exists to West Bay partly off road along the old Maiden Newton to West Bay railway line. Bridport was at one time a rope making centre and a fishing port but no longer. Bridport Museum tells the story. May be a tour of Palmer's Brewery A fascinating tour that ends with a taster of the real stuff. 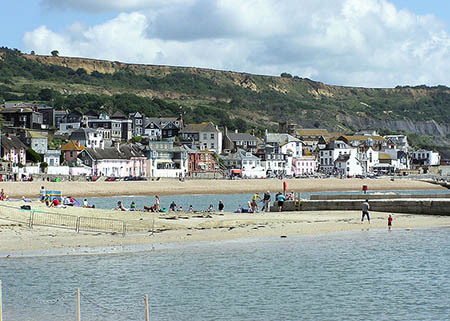 The town and surrounding area was the setting for the TV series "River Cottage" Also for 1990's series “Harbour Lights” which told of the life of a Harbour Master. Starred Nick Berry. While staying in Bridport an interesting pedal would be the Eggardon and Powerstock bike ride. (Re check the brakes!!) Cross the NCN 2 and take the road out of Bridport towards stone built Mangerton. Ride along the deep tree lined lanes and green steep hills running parallel to the Mangerton River. 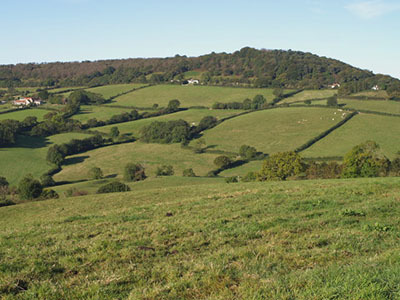 Ride north and then east towards South Poorton which has a Dorset Wildlife Trust 20 acre Reserve. The Reserve is grassland and aims to show how pasture used to look like before fertilisers and pesticides. Small animals and birds are making a gradual comeback. Listen to the bird song! 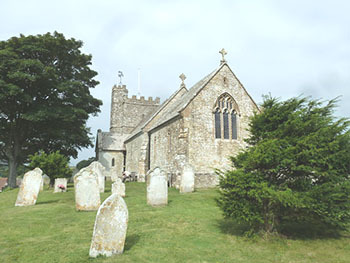 The twin village of North Poorton's church of St Mary Magdalene was another church that John Hicks with his articled pupil, Thomas Hardy, worked on. John Hicks was responsible for the church's complete rebuilding using some of the original structure. Continuing to cycle north and then south again the green rolling trail passes Powerstock Common an outstanding area managed by the Doret Wild Life Trust. At Eggardon Hill the views are magnificent! It is an old Iron Age hill fort with Bronze Age burial mounds. The amount of work that must have gone into its construction is incredible. All done by hand! Just amazing. The Romans had two camps there. With those views they would have commanded the area as did the Iron Age inhabitants. The Saxons used it as the meeting place for the hundred – a division of a shire used then for organisation and the meting out of justice. The cycle trail now strikes west downhill to pretty and ancient Powerstock. Was originally Poorstock but the railway company changed that c1857. The Normans built Powerstock Castle and created Poorstock Forest for hunting. The Castle was changed to a Hunting Lodge for King John. There are two wells here with strange, grim stories. It is said of one that a jealous husband threw his wife into the well. Apparently the water runs red at certain times, perhaps her blood or perhaps the red dye of her petticoat. The other well - the story goes that a man drawing water thought of making a pact with the Devil and the Devil appeared. He asked the man whether or not he intended to, but the man answered that he would finish what he was doing first. At that the Devil put a burning candle into the water of the well and when it went out the Devil took the man's soul. The Church is built on a mound that once was the foundation for a castle that watched over the area. The castle was built by Athelstan, grandson of King Alfred the Great. The Normans replaced the castle with the Church of St Mary. There is a lovely carving from the 1400's said to be of Good King Wenceslas and St Elizabeth of Hungary giving bread to children. The church has a very rare and almost unique relic, that of a Dole Table made in the 1200's where, before the Reformation, bread was given to the poor. It would seem that Powerstock has always been a very compassionate place. The BBC produced Agatha' Christie's “A Murder is Announced” in Powerstock. Continuing uphill out of Powerstock the cycle trail goes to West Milton, again parallel to the Mangerton River. Many of this village's pretty cottages were built in the 16th Century, but it is largely a holiday or commuting village these days as are many villages. Both the shop and the pub are long gone. Beautiful though. The trail passes over a lane and continues parallel to the river and returns along the road outward back to Bridport. Back to the NCN 2 from Bridport the cycle trail goes north west. Runs parallel to the River Brit through Pymore with its development of new housing. 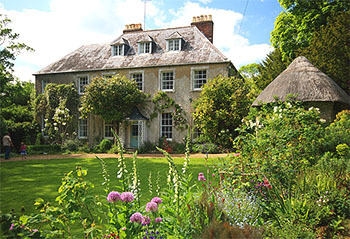 Beyond River Cottage, Hugh Fearnley-Whttingstall's second property was near Dottery. River Cottage H.Q. At 44 acres, ten times bigger than the original River Cottage. Now they are at Park Farm on the Dorset Devon border. Lovely place is the Marshwood Vale. These fields have been here for centuries with hedgerows put in by oldtimers when oldtimers were oldtimers. Homes for the abundant wildlife in this unspoilt corner of England. Wildflowers bloom, birds sing joyfully, pretty butterflies flutter by, small animals amble and scurry about their business where their own ancestors lived. The scenery is wonderful, high hills, lovely wide open valleys. Skirting the steepest hills the trail runs past Cutty Stubbs and down to Whitchurch Canonicorum capital of Marshwood Vale. The Church of St Candida and St Cross is the Cathedral of the Vale and has been here since Saxon times at least. Alfred the Great willed the area to his youngest son. Candida is Latin for White and refers both to the light coloured stone of which the church is made, but more importantly to the shrine and stone coffin in which lie the bones of a Saxon woman said to be St Wite. Westminster Abbey has the only other relic of bones that survived the Reformation and they are of Edward the Confessor, the last Saxon King of England, well apart from King Harold who lost the Battle of Hastings. A Saxon Holy Woman and hermit, St Wite lived on the cliffs. She was said to have guided sailors by lighting beacons which on a stormy channel night must have been a welcome sight of home but much more a timely warning of the cliffs themselves. It is said she was killed by the Danes, may be for that reason. Although definitely not known it is quite likely she may well have warned the locals of their coming. There was a battle with the Danes at Charndown Hill in 831. After that the Danes ran riot and killed many of the local population. Alfred had many a battle with the Danes and was always rushing from one end of his kingdom to the other with his army. He built England's first navy to fight with these Vikings. Memorials are not new, Alfred built a chapel called St Wite's Church c880 for those who died in that battle, on the site of the present building. Of course there may have been a previous church earlier than this - and this one has been extended. The church was a place of pilgramage to the bones of the saint who was said to heal. The openings in the shrine were where the diseased limbs were put or may be things that belonged to the sick person. If a cure was made a candle was lit that was apparently as long as whatever was cured. 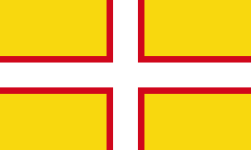 St Wite's Cross is also on the Dorset Cross or the Dorset flag. It is the central white cross. 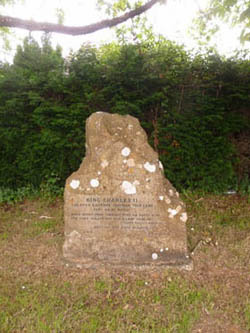 Admiral Sir George Somers minus his heart is buried at Whitchurch Canonicorum. His heart is buried in Bermuda at his request, his bones brought back to Dorset. Born in Lyme Regis in 1554 he had an eventful life. He was both a Mayor and a Member of Parliament for his home town at different times of course. Captained several Naval ships and was in several naval actions, was part of the beginning of the colony of Virgina, but is best known as the founder of Bermuda, aka the Somers Isles. A more recent burial in this ancient churchyard is that of the Bulgarian dissident writer, Georgi Markov. He was the victim of the “Umbrella Murder”, actually a successful assassination with a poisoned umbrella stab, at a bus stop near Waterloo Bridge in London. He died a few days later on 11 September 1978, he was only 49. On his tombstone are the words, "Bulgaria's most revered dissident" in Bulgarian on one side and English the other. Take a short detour to Morecombelake where St Wite's well still exists and has been restored. It is fenced off for security. This site too is said to have healing properties, especially for eyes, but the water does not look too clean - so perhaps not! There is an open footpath, but it would be wise and perhaps polite to push the steed. Not all that far. While in Morcombelake take time to pick up some refreshment. Dorset knobs are a long established favourite of the local population. Moores Biscuit Bakery has been making them for generations. Take a tour of the factory and see them being made as well. (Buy some of their biscuits, they are tasty! )There is an art gallery in the shop which is quite an added attraction. You will find the shop on the A35. The little chapel looks old but was built in 1841. The cycle trail now turns towards Wootton Fitzpaine over the River Char. Before Wootton Fitzpaine is reached there is a four and half mile mini route/detour to Coney's Castle and Lambert's Castle. Somewhat of a test of fitness!!!!! Coney's Castle is an Iron Age Hill Fort with wide and wonderful views to Golden Cap. It was built by the Durotriges tribe. Steep ramparts guarded the countryside. It is approxmately 689 feet high. Coney is Old English for rabbit and so was at one time a very large rabbit warren and a source of meat for medieval folk. That lane running across the top is quite old and is part of the Wessex Ridgeway Trail. Lambert's Castle is even higher at about 840 feet. Another Iron Age Hill Fort. Owned by the National Trust and an area of Scientific interest because of the importance of its geology, archaeology and ecology. There is a great view of Pilsden Pen. Like Coney's Castle, Lambert's Castle is a rabbit warren. The leg back to the NCN2 comes out past the cycle way to Charmouth. So a visit to this pretty seaside town means a pedal back along the cycle way. For those for whom a visit to Coney and Lambert's Castle was not a practical idea the turning to the cycle way to Charmouth is past Wootton Fitzpaine. This detour too is a little hilly but it is only a couple of miles or so. The town itself can be a somewhat traffic heavy in summer so great care is needed. 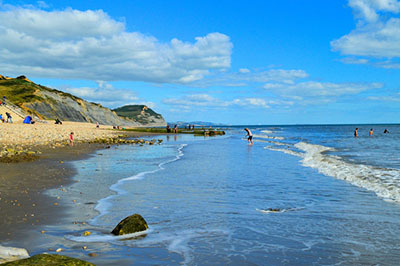 Charmouth itself is an attractive, ancient seaside town that goes back thousands of years. It is mentioned in the Domesday Book as a place where another battle with the Vikings took place. The beach is partly sand and partly pebble with the Jurrassic Coast behind. The Jurrassic Coast Heritage Centre is alongside the shingle part of the beach. There are interesting interactive displays of both fossil and the wildlife of the area. Knowledgeable volunteers are around to answer your questions and even identify your finds. It is open from Spring Bank Holiday to the end of September, plus the Easter Holidays and the autumn half term. The cliffs themselves are unstable and considerable care is needed in exploring and fossil hunting. Wardens run guided tours that are very informative and certainly safer! 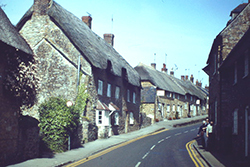 The town itself has both 16th and 17th century cottages and fine Regency houses. Catherine of Aragon stayed in the Queens Arms in 1501 on her way to marry Henry VIII's brother, Prince Alfred. King Henry VIII was her second husband after Prince Alfred died. The Queens Arms is much older than it looks as a new front was added in Georgian times. Charles II was hidden in Charmouth during his escape through Dorset after the Battle of Worcester in 1651. Now for the last leg of the cycle ride to Lyme Regis. The trail passes Monkton Wyld with its neat little church. A little chance to while away the time exploring a small Dorset village. The NCN 2 in Dorset ends at the junction of the B3165. To get to Lyme Regis turn left down the B3165 for a short distance and turn right to take the cycle link into the town. This is a busy section so take care with both junctions. The cycle trail swings out and comes to a junction with the A35. Once again take care as the trail goes along this road until it meets the B3165 again. After this junction the trail runs past Harcombe Bottom and in to Lyme Regis. Lyme Regis, aka The Pearl of Dorset, a stunning little seaside resort as old as time and as modern as tomorrow. At the mouth of the River Lim on Lyme Bay, Still part of the wonderful Jurrassic Coast now with blue cliffs. Spend a little time relaxing in this lovely and hilly place before perhaps cycling back or continue into the lovely county of Devon. Return from Cycle Route Dorchester to Lyme Regis as a Short Holiday to Home. Or you may wish to browse some more, please do. You will find navigation buttons above on the left.